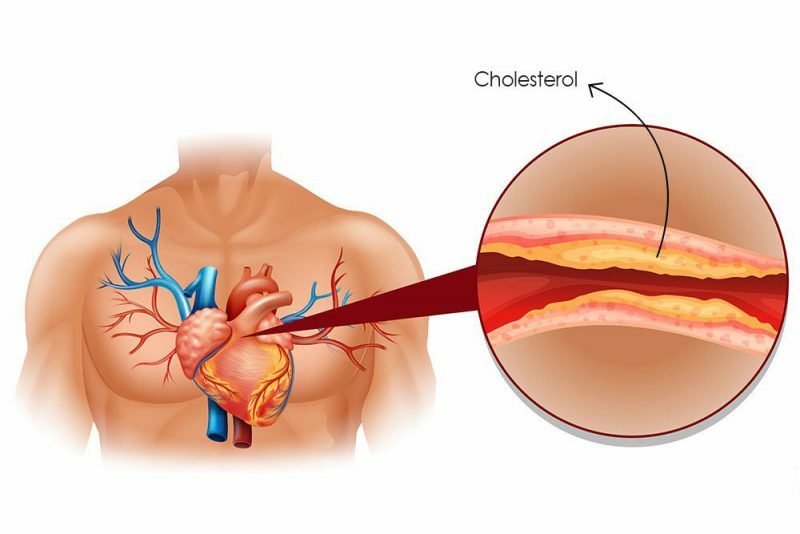 In this post of Homeo Expert, we shall discuss the best homeopathic medicines for High Cholesterol or best Homeopathic Remedies for high Cholesterol. Cholesterol is a waxy or fatty substance that is present in our blood to perform normal functioning. The normal level of Cholesterol in the blood is less than 200mg/dl when the blood crosses this limit, we call it high Cholesterol. There are no symptoms available unless it deposits in the blood vessels. When the Cholesterol gets in the arteries then the lumen get hardened and narrowed and it leads it to Arteriosclerosis. The blood supply to different organs become difficult and it leads it to many symptoms. When the carotid arteries narrow which supply blood to the heart, it leads to shortness of breath and chest pain. The complete blockage of coronary artries leads to heart attack. When the blood supply to the brain is blocked, it leads to paralytic symptoms and memory loss. Homeopathic treatment for High Cholesterol can decrease the high Cholesterol levels in the blood. Additionally, they also dissolve the deposits of Cholesterol which are near to arterial walls. Homeopathic remedies for high Cholesterol are produced of natural substances, therefore, they do not have any side-effects. LDL is a bad cholesterol which takes the Cholesterol particles throughout your body. They made in the walls of arteries and it makes the walls hard and narrow. HDL is a good Cholesterol which takes the excess of Cholesterol and transports it back to the liver. High Cholesterol does not show any symptoms, therefore, you need to detect it using blood report. Cholesterinum is one of the top homeopathic remedies for high Cholesterol treatment. Allium Sativum is one of the best homeopathic remedies for high cholesterol levels. This homeopathic medicine for high cholesterol is made from garlic, therefore, it is a natural treatment for cholesterol and it gets rid of the excess of cholesterol in the body. If the patient has hypertension due to Cholesterol deposit in the arteries, it is the best medicine for the patient. Additionally, we also suggest this homeopathic remedy for Cholesterol when the Cholesterol develops due to the excessive eating of meat. The patient of this medicine craves for meat with an increased appetite. In addition, the symptoms of acidity, burning in stomach, belching and burping may follow. Aurum Met is one of the top homeopathic remedies for high Cholesterol and it is made of gold. The patient of this medicine complains of high blood pressure and his arteries will become hard due to Cholesterol. There is a rapid and irregular pulse with violent palpitation is also present in Aurum Met. The patient of Aurum Met may feel pain behind the sternum, especially at night. In addition, there are some marked mental symptoms of this medicine, the patient becomes angry at the slight contradiction leads him to think of committing suicide. Calcarea Carb is one of the best homeopathic remedies for high Cholesterol when the patient is fat or overweight. The patient of this medicine desire for boiled eggs and sensitive to cold air as well. Excessive sweating on the scalp is another marked symptom of homeopathic medicine Calcarea Carb. The patient of this medicine feels tightness in the chest and he also feels suffocation on going upstairs. We also suggest this medicine when the patient feels excessive palpitations at night or after eating meals. It is another natural homeopathic treatment for high Cholesterol who desire for fatty food and alcoholic drinks. In such cases, the patients are full of anger and irritable in nature. They also suffer from constipation. Crataegus is one of the natural homeopathic remedies for high Cholesterol and we recommend it as a tonic for heart muscles because they become weak due to the decreased supply to the heart. This natural homeopathic remedy helps to strengthen the weak muscles and regularize the function of the heart. It is also one of the top homeopathic remedies for high Cholesterol which dissolves the deposit of Cholesterol available in arteries. Baryta Mur is considered to be one of the top homeopathic remedies for high Cholesterol in elderly people and the arteries of elderly people also become firm in nature. The systolic blood pressure remains on the higher side in the patient of Baryta Mur. Baryta Mur is a beneficial homeopathic medicine for high Cholesterol when the deposit affects the heart and brain. If the blood supply to brain reduces and it results in heaviness and Vertigo, we can treat these symptoms using Baryta Carb homeopathic medicine. Strophanthus Hisp is one of the excellent homeopathic remedies for high Cholesterol when it shows extreme effects. This homeopathic medicine is helpful and you can use it in old age to strengthen the weak heart muscles. it also has the ability to drop the effects that occur due to the extreme effects on the heart because of high Cholesterol levels. The heart problems as a result of high Cholesterol and tobacco smoking can be treated with Strophanthus Hisp. In this medicine, the symptoms of cardiac pain, palpitations and breathlessness are also present. We can also consider Lycopodium and Pulsatilla in some cases.